February has been the worst month for SavingsPinay because I failed to blog everyday and I feel so guilty that I didn’t publish that much content. Anyhow we still have some highlights of the month so let me share to you a quick recap of how February went. We reached 109,000++ Pageviews. Whoo… last month we just reached 100k pageviews and now we are so near to 110,000!!! My goal for March is to reach 115,000 so hopefully it would happen. Pageviews are important for me because it means the blog is getting noticed and being seen by people. Mt. Manabu Hike. I still can’t believe that this happened. I hiked for the first time!!! And I shared my experience in my personal blog IzzaGlino. Here in SavingsPinay I created an Expenses and Itinerary post so if you want to read that one please go over my archive. First Out of Town Trip. I went to Pampanga last last week and it was a blast. I set a budget for the trip and it’s my very first time to go out of town. It’s a nice experience and I will be doing an expenses and itinerary post. First Event Host of the Year. 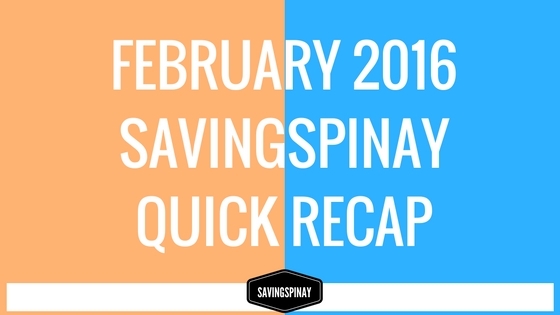 Just like what I mentioned in my SavingsPinay January Quick Recap I wanted to go back event hosting. Last February 20 I did my first ever event of the year and it was a wedding at Island Cove Cavite. I felt so much accomplished and can’t believe how much I miss hosting. (3rd Most Viewed) How Much Do I Really Make?